We have parish records of Cole's being in Mattishall since the early 1700's. However the main line of the Cole family that were prominent in the village in last 200 years originated from a Thomas Cole and his wife Ann Harvey. Ann was from Carlton Rode, Norfolk which is between New Buckenham and Long Stratton. It is not clear where Thomas was born as no records have been found but we do know he was living in Mattishall by 1771 for on their marriage record of October 22nd at the parish church of St May's of Carlton Rode Thomas was recorded as a bachelor of Mattishall Burgh. Records show Thomas and Ann had at least four children, Anne born about 1775, Elizabeth about 1776, Sarah about 1779 and Benjamin about 1783. Although there could have been others between their marriage and the birth of Anne in 1775. For reason not known the three daughters of Thomas where still single up to their early 30's. Maybe they where needed at home, maybe their father was ill, We see Thomas died in 1800 at the age of about 62 so maybe he was not able to provide for the family. Or maybe the right men never came along. However between 1805 and 1810 all three girls gave birth to illegitimate sons. Anne Cole: Anne was born in Mattishall Burgh in 1775 and baptised at All Saints Church on September 10th 1775, the daughter of Thomas Cole and his wife Ann Harvey. It appears Anne had gone to East Dereham we assume for work, or as it was known then 'In Service' meaning maily domestic duties. During her time there she fell pregnant and at the age of 30 gave birth on May 12th 1805 to a baby boy which she named William Cole he was baptised at the parish church of St Nicholas three days later on the 15th. For reasons unknown, but probably due to child birth issues Anne died at the age of 31, she was buried in St Nicholas Churchyard on September 19th 1805. Her parents or family must have brought baby William back to Mattishall as we find William was baptised again on June 6th 1806 this time as William Hardey Cole, probably Hardey was William's father and Annes family wanted it displayed on record. Although records have never been found to show William used his middle name during his lifetime, in 1837 we see he named one of his sons Hardey. Maybe this was his way of giving tribute to the mother he never knew or maybe he later got to know his father. Whatever the reason naming his son Hardey seams to be some kind of statement - This line of Cole's were the main line who stayed in Mattishall. We find later three of the daughters married Norton's another old village family of Farmers, land owners and Bakers. In the early 1900's one line of the Coles was the village Post Master. Elizabeth Cole: Elizabeth was born about 1776 although we have no baptism record. Nothing is known of her early life but on March 16th 1809 at the age of about 33 she gave birth to a son, Robert Cole who was baptised at All Saints Church Mattishall on March 16th 1809. We then find another baptism record for Robert this time on at St Peter's Church Mattishall Burgh on May 21st 1815, added to the record was the note 'illegitimate Son'. The next record down in the parish book was of her sister Sarah who had also baptised her son on that same day. Robert Cole married Rachel Ellis a 23 year old Spinster at St Peter’s Church Mattishall Burgh in July 1840. Robert's cousin Stephen Cole (below) and we assume Stephen's wife Sarah Cole were witness to their wedding. In the 1841 census Robert, now a 30 year old Farm Labourer and his wife together with his 9 month old daughter Jane Caroline (Selina) Cole were living at Low Road Mattishall Burgh. Living at the same property with her son was Elizabeth Cole (1776). Elizabeth never married. Sarah Cole: Sarah was born about 1779 also in Mattishall but again we have no baptism record. Sarah when aged about 31 also gave birth to an illegitimate son which she named Stephen Cole born in 1810. As in the case of her sister Anne Cole (1775) and her son William, Stephen was also baptised twice. Once on September 18th 1810 at All Saints Church Mattishall, the second on May 21st 1815 at St Peter's Church Mattishall Burgh. As mentioned above Stephen Cole was baptised on the same day as Robert Cole (Elizabeth's son). We do know in this case that the father of Sarah's son was Robert Fearall Beeston but it is unclear why they never married, maybe he was already married although no records have been found to show this was the case. However on December 14th 1811 A Barstardy Order was issued against Robert Fearall Beeston of Mattishall for a male child born to Sarah Cole a single woman on Sep 16th 1810. Robert to pay 13 shillings and 6 pence then 2 shillings and 6 pence weekly. Sarah to pay 1 shilling and 3 pence per week if she does not care for the child herself. Sarah Cole went on to marry widower Benjamin Huggins a Weaver on August 10th 1818. They lived in Mattishall where Sarah had other children by Benjamin. Benjamin Huggins died in 1844 at the age of 84. Stephen Cole became a Shoemaker and lived for many years with his wife Sarah Carr and their children in Church Square Mattishall where he, and later two of his sons were shoemakers working from home. Stephen and his family then move to Norwich where it seems his children thought it better to work in one of the many Shoe factories there which would have given better security and a regular income. Sadly Stephen finished his days in 'Thorpe Lunatic Asylum' he was to die there 1882. His son James lived on Lawson Road and George on Silver Road Norwich where his wife and son had a corner shop. Benjamin moved away from Mattishall - His wife Blythe died in 1844 and Benjamin died in 1860 both are buried in parish churchyard. It appears that they lived in Mattishall Burgh before settling in Mattishall. There is a document (now in the Norfolk Record Office) called an Acknowledgement of Settlement which was issued by the officials of Mattishall Bergh to the Overseers of Mattishall on 9th January 1772. This meant that if by any chance THOMAS and ANNE COLE fell chargeable on the Parish through illness or unemployment, the Overseer of Mattishall Bergh would take responsibility for their maintenance. Apart from her own baptism record very little is known about Anne, she next appears at East Dereham where on Wedesday May 15th 1805 she has he son William baptised at St Nicholas Church which is at the bottom of Church Stree in the centre of the town. It is not known if other family member were present as they were never included on these records. The entry before was on the 12th, the one following was on the 16th, making Ann's the only baptism of that day. The next record sadly is Ann's burial record as she died only 18 weeks after giving birth to her son. She was buried on Thursday September 19th 1805 in St Nicholas Churchyard. No cause of death is mentioned. Anne left an infant son who we find was brought back to Mattishall, we would assume by Ann's sisters and mother where he rained for the rest of his life. His decendants give us most of the Cole's that we have documented in Mattishall's recent history and memories. William's story can be follow in the next record down. WILLIAM HARDEY COLE 1805. William was baptised again this time the name 'Hardy' is used which could be the name of William's father. M Marriage Reg:November 1824-March 1837: No.17 William Cole otp Bachelor & Hannah Barsham (sic) otp Single Woman were married by Banns this 4th Day of December 1826 By me Peter Still Curate. W & H made their marks. Witnesses: Robert Keeler made his mark & Ruth Holmes signed. In 1891 they were living at Horseshoe Street Winburgh - 1911 they were living in a 2 room property on Norwich Road Yaxham. Thomas was a 50 year old Farm Labourer and Ellen was 47, she had had four childred 2 of which had died. With them was their 13 year old daughter Elsie. Marshall Cole – Head – age 34 – Grocer Shopkeeper living on own account at home – born Gaverston. Additional Information: Son of Marshall and Florence Cole, of Lime Tree Farm, Mattishall. In 1891 they were living at Low Street Hardingham where George was a farm Labourer. They had 2 children: Harriett A. age 4 and Charles W. age 2. In 1911 they were living at Welborne where William/Geroge was a 61 year old Farm Labourer, Mary 52 and had given birth to 6 children 3 of which had died. With there were their three children, Harriett Alice 24, Charles William 22 and Harry 19. Daughter of Robert Cole a Labourer and his wife Rachel Ellis – Jane was later known as Jane Caroline Cole. After the 1871 census Jane and Henry (Samuel Henry) were living at East Rainham - Samuel died in in the Dec quarter of 1876 age 36 and was buried on December 19th at East Raynham Churchyard - Entry 582. Notes: Died instantaneously by falling off a waggon load of hay as the rope broke. A few doors up at number 39 is what appaers to be Henry's brother Robert Watts age 39 with his wife Ellen formerly Cubitt for Colkirk Norfolk and her children from another marriage. In 1901 Benjamin Cole age 57 and an Ironstone Miner was living at 23 South Street Eston Yorkshire with is wife Jane Ann age 49 and their eight children, Arthur 32, James 26, William 24, Albert 16, Sydney 14, Charles 12, Benjamin 9 and Elsie 4. By 1911 they had moved to 11 South Street Eston where he recorded himself as Ben age 67 and a retired Miner. Jane was 59 and it is recorded that in their marriage they had eleven children, five of which had died. William 34, Sydney 24, Ben 20 and Elsie 12 were still living with them together with a lodger, single, 24 year old Henry Harrison a Butcher. 1865: January 10th - George Cole age 19 a bachelor married Jemima Newell age 15 a spinster at North Tuddenham by Revd Robert Barry Entry 58 - Father's: William Newell a Labourer and Robert Cole,deceased - George made his mark & Jemima signed - Witnesses: Rachel Cole signed & James Elliott made his mark - More on Revd Robert Barry click HERE. In 1871 George and Jamima were living near the church at Mattishall Burgh with thier two children George Albert 2 and Loiusa 1. George was an Agricultural Labourer. They were still there in 1881 their address is now given as 'Near Nortons Farm' - George Cole was then aged 34 and a Farm Labourer with Jamima age 33 together with their three children Lousia 12, Arthur 10 and Caroline 3. They were living a few yards away from Rachel Cole, George's mother. In 1891 the whole family had moved to North Yorkshire where we find them at 34 South Street Eston North Yorkshire just a few doors away from his brother James/Benjamin Cole (1843) George is recorded to be age 45 and an Iron Stone Miner with Jemima now 41, together with Caroline 15 and William 9. In 1901 they had moved to 4 Bottomley Street Eston George is now 54, no occupation is listed, Jemima is 53, with them is thier son William a General Labourer age 20. 1906: Death record - Jemima Cole at Middlesbrough - Mar quarter (9d 408) age 57 - February 22, 1906 at 93 Jubilee Road Eston, N. Yorks. 1912: George died on May 7, 1912 in 22 South Street, Eston, N.Yorks. at 22 South Street, Eston. Death Cert: George Cole, Male, 65 years, Rag and Bone Merchant. Cause of death Lobar Pneumonia (double) 4 days, Cardiac Failure Certified by John S Thomson M B. Informant Robert Cocker, Present at the death, 7 Bottomleys Row, Eston. Registered on 7th May 1912. J H Brentnall, Registrar. 1874: Apr 21 - Arthur Cole age 21 a Bachelor and Labourer married Charlotte Earl age 20 and Spinster at St Peter's Church Mattishall Burgh - Entry 21. 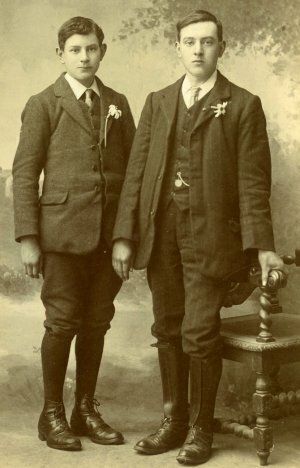 Father's: Robert Cole a Labourer and John Earl a Chimney Sweeper. Witness: Henry Harwood and Marianne Smith. Charlotte was the daughter of John Earl and Elizabeth Fisher. She was born in the Dec quarter of 1853 at Mattishall/Norfolk. In 1881 Arthur was a 29 year old Iron Miner and Charlotte age 27 were living at 42 Harker Street, Skelton Yorkshire. With them were their children Elizabeth 6, who had been born in Mattishall, Charles 5, born at Guisborough, John 3 and Arthur 1 both born in Skelton. In 1891 the family had moved to 39 Boosbeck Road Skelton where Arthur was still a Miner but the family had increased a little more with Charlotte, Rhoda, Elizabeth, Florence and Harry. 1901 they had returned to Harker Street this time 73 & 75 as we see the family had increased even further with Elsie, Alice and a son called Clair. Arthur was still an Underground Miner. In 1911 the family had moved to 16 Portland Crescent, Station Road Ashington, Northumberland. Arthur was now 58 and a Baker and Confectioner (employer) Charlotte age 57 was Assisting in the Business. With them were Charles, Charlotte, Harry, Elsie and Clair who were also all helping in the business. They had a lodger by the name of Frederick Fenton aged 22 and a Carter for the Bakery. Charlotte had given birth to 12 children all survived. 1910: Kelly's Trade Directory for Ashington - Arthur Cole and Son, Confectioners, 15 Portland Crescent Ashington Northumberland. Charlotte Cole, female, aged 88, widow of Arthur Cole a Baker (Master) - Cause of death 1(a) Cardiac failure, (b) Senility. Certified by L. Fairburn M.B. Name and address of informant Charles Cole, Son, present at the death, 5 St Andrews Terrace, Ashington. Registered on 17th April 1942. Jos.A. Robson, Registrar. Cole Arthur of 77 Station Road Ashington Northumberland, Baker, died 3rd Nov 1917 - Administration Newcastle on Tyne to Charlotte Cole, widow - Effects:- £73 - Arthur Cole was a Master Baker and together with his wife Charlotte ran a bakery and confectionary shop at 77 Station Road Ashington. The couple had 12 children but only 8 of them moved with their parents to Northumberland. Their son also named Arthur married Louisa Emma Smith in 1908. He also ran a shop at 1 Catherine/Katherine Street, Hirst. It was a General Dealers. Another of their sons also became a shopkeeper. John Robert Cole, married Minnie Best in 1904 at which time he was a Coal Miner. He and Minnie later moved to Red Row, Bedlington Station where they ran a General Store attached to their house. Robert is reported to have died in September 1846 (approx.) in Shoreditch, Middlesex. It is not clear why Sarah and Robert never married, maybe he was already married although no record has been found of that fact. 1811: Dec 14 – Barstardy Order was issued against Robert Fearall Beeston of Mattishall for a male child born to Sarah Cole a single woman on Sep 16th 1810. Robert to pay 13 shillings and 6 pence then 2 shillings and 6 pence weekly. Sarah to pay 1 shilling and 3 pence per week if she does not care for the child herself. Benjamin Huggins was listed in Mattishall Poor Rate Books as renting a cottage belonging to the Parish almost up to the time of his death in 1845. At the end, they were living in one of the Parish Town Houses (cottages where poor people were accommodated) but Benjamin Huggins actually died at Gressenhall and probably was buried there. It is recorded that his coffin cost 11 shillings. Sarah was buried at Mattishall on 8th July 1862, aged 84 years. In 1851 Margaret was an 18 year old Servant Nurse for Philip Case a Chemist and Druggist and his wife Emily nee Taylor of Snendors Yard Colegate Norwich. We assume looking after their three children. Emily was born Emily Margaret Taylor the daughter of William Taylor Gentleman and Land Owner of Mattishall Burgh and his wife Lydia Wright. As the Taylor and Cole families were virtually neighbors back at Mattishall Margaret would have been known to them. In the Dec quarter of 1861 Margaret Ann Cole married George John Want at Mitford. George a 19 year old Shoe Maker born at St Faiths Norwich, the son of James Want a General Weaver and his wife Martha. In 1871 we find Margaret and George, George now John George Want were living at Constitution Place Norwich where he is recorded as not only a Clicker but a Local Primitive Methodist Preacher. Staying with them is Margaret's father (see 1871 census below). In 1881 Margaret now age 48 was living on the Main Road at Sprowston, Close to Denmark Place Norwich where George was a Shoe Maker and Local Preacher, with them are two children George Thomas 17 and Laura Margaret 15. In 1891 Margaret and George were living at 6 Knowsley Road Norwich, George was a Boot Clicker and Primitive Methodist Preacher. At this time Knowsley Road only went up to 42 and 31 the other side as the houses were still being built. In 1901 George now age 59 was an Insurance Agent, Margaret was 68 and they were still living at 6 Knowsley Road. In 1851 Elizabeth was House Servant at Boyland Hall Morning Thorpe, the hall was owned by the Irby family but at this time it was empty with only the House Staff in residence. It was headed by John Easton their Butler. The hall was demolished in 1947. Elizabeth married Richard Brereton in the Jun quarter of 1856 at Norwich. Richard was baptised on Aug 5th 1832 at St Lawrence Church Norwich - Entry 602 the son of Richard Brereton a Carpenter and his wife Elizabeth unknown. In 1861 Richard was a 28 year old Carpenter and Joiner, Elizabeth was 26 they were living at Vauxhall Street, Heigham, Norwich. At that time Elizabeth and Richard had three children, Richard Robert 4, George Henry 2 and Walter James 1 month. In the Mar quarter of 1864 Walter James Brereton died, he would have been about 3. In the same quarter his brother George Henry Brereton also died he would have been about 5. In 1867 at the young age of 33 Elizabeth Brereton nee Cole died at Norwich in Dec quarter. However we find in the 1871 census Elizabeth and Richard had had another child together, Anna (Elizabeth Anna) Brereton born in the Jun quarter of 1863 at Norwich. Richard remarried to Elizabeth Bush of North Tuddenham in the Jun quarter of 1868, she was born on April 3rd 1839 the daughter of Edward Bush a Labourer and his wife Elizabeth Keeler. In 1871 were living in Belvoir Street Norwich. Richard Brereton died in the Sep quarter of 1908 age 75. His second wife Elizabeth Brereton nee Bush died in the Mar quarter of 1901 both at Norwich. In 1911 Anna Elizabeth Brereton was a 47 year old unmarried cook for a widow, Harriett Emily Miller and her two daughters at 1 Victoria Street Norwich, opposite the old Norfolk and Norwich Hospital on Newmarket Road. In the Mar quarter of 1912 Anna Elizabeth Brereton died age 49 at Norwich. Anna's brother now known as Robert married Harriett Holledge at Norwich in the Jun quarter of 1905. In 1911 they were living at 69 Leicester Street Norwich. Robert died age 80 in 1937 at Norwich, Harriet died in 1950 age 89. They had no children. In 1861 Sarah was a 21 year old House Servant for Philip Case a 47 year old Oil Cake And Manure Merchant at Heigham Norwich. Sarah had taken the place of her sister Elizabeth (1832) above. Philip's wife is Emily Margaret Case nee Taylor from Mattishall Burgh (details above). In the December quarter of 1866 Sarah Ann Cole married William Carr a Farm Labourer at Mitford. In 1871 they had no children and were living at Low Road Mattishall Burgh, living each side of them were Sarah's two cousin James Cole (1831) and Christmas Cole (1835). In 1874 Sarah and William had a daughter Lilian Carr, she was baptised at St Peter's Church Mattishall Bugh on May 24th 1874 - Entry 408. Sarah Ann Carr nee Cole died in September quarter of 1877 aged just 37. Now a widower William was living with his 7 year old daughter on Mattishall Road Mattishall Burgh. In the March quarter of 1881 William remarried to Sarah White, Sarah had been living near by near St Peter's church, the daughter of the late John White a small Farmer and his widow Susan. Lilian a 7 year old Scholar was living near by with Francis Edwards a Farm Labourer and his wife Charlotte nee Hill. In the Dec quarter of 1864 at Mitford George Cole married Anna Norton. Anna was the daughter of Matthew Norton (1812) and Emily Vassar - for more on the Norton Family click HERE. In 1871 they were living at Church Lane, St Clements, Norwich where George age was a 29 year old Shoe Clicker, Anna was 28 and they had a daughter Matilda 3, who was born at Sprowston. Matilda was baptised at a Primitive Methodist Church in Norwich on October 12th 1868. We would wonder if George's sister Elizabeth's husband being a Methodist Local Preacher had anything to do with the service. In 1881 the family had increased by two with Albert Henry age 9 and Florence Catherine 3, they were now living at Fleece Yard, St Edmunds, Nowich where George was a Boot & Shoe Warehouseman. In 1891 George and Anna had moved to 1 Afghan Place, Norwich. George was a Shoemaker, Martilda and Florence were Shoe Machinists and Albert a Grocers Assistant. By 1901 Geroge and family had moved to 50 Silver Road Norwich, a property which was a corner shop with living accommodation. The proprty was on the corner of Wodehouse Street. In 1901 Silver Road and all the surrounding area of terrace houses had only just, or were still being built. In the late 1800's there was a large building program taking place each side of Magdalen Road leading out of the city centre from Magdalen Gates up to Sprowston and St Clements. This included Silver Road as part of the outer boundry of the estate. 50 Silver Road would have been part of this, therefore George and family could have been one of the first families to occupy this property. We can date these properties by looking at some of the main building in the area, Just taking the Silver Road area, the Cygnet public house was openeded in Oct 1892, George White School was opened in 1903. Start-rite opened their new factory on Chrome Road in 1900 which would become the workplace for many who lived in this area. At the other end of Silver Road was the new City Tram shed which was the turning point and housed most of the trams that worked Norwich. The network was essentially complete and fully operational by the end of the 1901. In 1901: George was still recorded as a Shoemaker (worker) maybe he was employed by Start-rite? Martilda and Albert were General Shop Keepers living on their own account. It is noted on the census Albert was a widower. Albert had married Rosa Sarah Delves in the Sep quarter of 1896 at Norwich but sadly Rosa died the following years in the Mar quarter of 1897 at the young age of 26. Florence was still at home working as a Shoe Machinist. George Cole died in March quarter of 1906 at Norwich age 63. Matilda Cole still a single women died in the Sep quarter of 1909 age 41. Florence Catherine Cole married Frederick Thomas Oxbury in the Sep quarter of 1903. In 1911 the couple was living at 47 Glebe Road Norwich where Frederick was recorded as a 32 year old Certificated Assistant Teacher Head of Open Art Sch In Summer Months working for the Norwich Education Committee. With them were their three children, Harold Frederick 7, Dorothy Gertrude 4 and Frank Ernest 2. Also was a live in Gereral Domestic Servant, Happy Drake age 14 from Wicklewood. 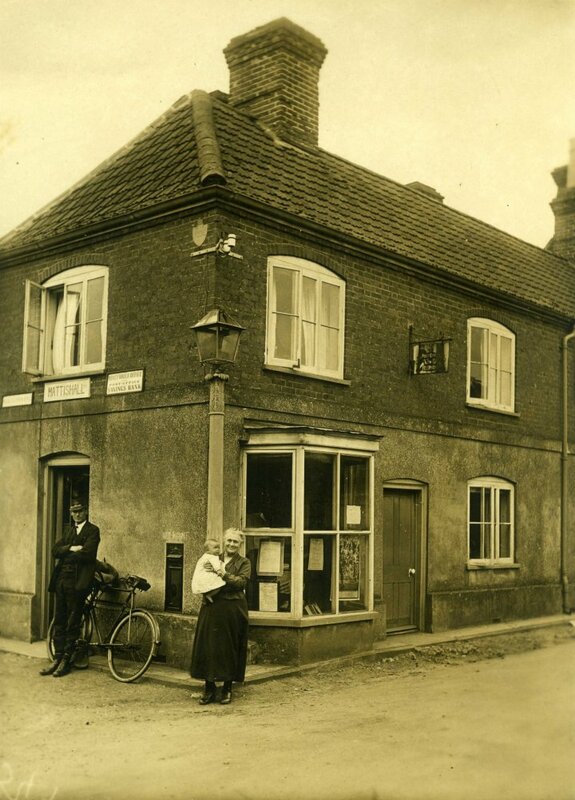 In 1911 Albert Henry Cole was Grocer Manager at the Post Office at Horning, Norfolk, he had remarried in the Mar qaurter of 1902 to Victoria Kate Thrower with whom he had at that time two children, Elsie Violet and Herbet Stanly. Living with them was his widow mother Anna Cole age 68. Anna died in the June quarter of 1927 at Smalburgh age 84. Albert remained Post Master till 1945. James Cole married Sarah Balls in the Dec quarter of 1864 at Norwich. In 1871 James and Sarah were living at Constitution Place, Sprowston Norwich (entry 32) where James was a 26 year old Boot Riveter, with them were their three children, Hannah 5, Alice 3 and Arthur 11 months together with James's mother Sarah Cole age 63, his father (Stephen) was staying with his sister Margaret Want, entry 46. James and Sarah were also members of the Methodist church at or just before this time as Hannah was baptised as Ann Elizabeth Cole on Sep 16th 1865 at a Primitive Methodist Church in Norwich. In 1881 the family was living at Church Street St Clements Norwich (entry 229) James was a Boot Clicker and Sarah was also now employed as a Boot Machinist, as was Anna their daugther, Alice was age 13, Arthur 10, Frederick 8 and Herbert 5 were all Scholars with Ethel aged 1. In 1891 James was a 46 year old Boot Clicker, Sarah 45, Arthur was also now a 20 year old Boot Clicker and Frederick age 18 likewise. Herbert age 15 was an Apprentice Clicker, Ethel 11 a Scholar. Their address was 54 Lawson Road Norwich. They were still at the same address in 1901, James still a Clicker, Sarah was looking after the family, Herbert appears to be known now as Robert 25, Ethel 21, a Drapers Assistant. Ten years on and they were still at 54 Lawson Road in 1911 James is now a 66 year old General Shopkeeper living on his own account, Sarah age 66 is recorded as having had 6 children 3 of which had died. Lodging with them was Agnes Elizabeth Miller a Tailoress. It is not known where James's shop was as 54 Lawson Road is a middle terrace houses, although the road is a little diffrent now as only a few doors away from 54 the houses are modern as the road was bombed during the Second World War so there could have been a shop nearby. James Cole died age 72 in Dec quarter of 1916 at Norwich - It appears Sarah Cole nee Balls died age 76 in the Sep quarter of 1920 at Smallburgh. Was she staying with her nephew Albert Henry Cole at Horning or somewhere in that area? Mary Ann Cole married Stephen Bales in the Jun quarter of 1867 at St Faiths. Stephen was born in the Dec quarter of 1844 at Bracondale, Norwich the son of Benjamin Bales a Gardener of Ingoldisthorpe, Norfolf and his wife Elizabeth Baldwin of St James, Norwich. In 1871 Mary Ann and Stephen were living at 4 Church Lane St Clements, Norwich where Stephen was a 26 year old Boot Rivetter and Mary Ann know Marianne was age 24. With them were their three children, Edward 3 who had been born at Mattishall, Edith 1 born at Sprowston and Elizabeth who was 1 week old. Staying with them was Caroline Hook a 32 year old Nurse. It was interesting to find that Stephen's farther (Benjamin) was living next door to Mary Ann's sister Margaret Want nee Cole (1832) at Constitution Place and just a few doors down was he brother James Cole (1844) and his family. By 1881 they had moved to 1 Bakers Road, St Augustine, Norwich. Stephen was a 37 year old Shoemaker and Marianne was a Machinist age 34, Edward 13, Edith 11 and Elizabeth 10. Marianne Bales nee Cole died in the Mar quarter of 1888 at Norwich she was only 41. In 1891 Stephen, now a widower was living at 105 Waterloo Road, Norwich, he was still a Boot Riviter and he gave his birth place as Butters Hill Lakenham (now Carrow Hill, Bracondale). With him we find another daughter (Rosanna Bales) who had been born just before her mother (Marianne) died in 1885 at Waterloo Road. Also on the return was his daughter Edith age 21. Edith had married Thomas William Cole (no relation) age 22 and a Shoe Clicker. Thomas was born in 1869 at Norwich the son of Samuel Cole a Foreman Shoe Machinist from High Bickington, Devon and his wife Elizabeth Blyth from Norwich. In 1881 Thomas Cole and his parents had been living at 28 Bakers Road so Elizabeth and Thomas had grown up together. 1901 and Stephen had not remarried, he was a 56 year old Oil Hawker now living at 107 Waterloo Road, with him was his daughter Rosa age 25 a Tailoress. His other daughter Edith was also living there with her husband Thomas Cole, he was a Milk Hawker. Stephen Bales died in the Jun quarter of 1910 age 65 at Norwich. After her father died Rosanna went to work for Rev Richard Wilton a 59 year old Minister Of United Methodist Church and his wife Alice Blanche at their home Epworth House, 1a Aylsham Road Norwich. In 1911 Rosanna Bales was a 26 year old Domestic Servant living at this address with the Revd, his wife and five children. Records show Rosanna Bales married in the Sep quarter of 1912 at Norwich to Alfred Charles Howes at Norwich. They had a daughter Gladys Eleanor May Howes in 1913 they were living at 11 Catherine Wheel Opening, St Augustine Street, Norwich. 1891: Census: - Charles and Mary had moved to Ellingfoot Road Hackney London where Charles is a 34 year old Boot Laster and Mary Ann is a 36 year old Tailors Machinist with them is their son Edmund Cole 9. 1911: Census - Charles was living at Lower Green Hawkley Hants where he was a 50 year old Boot Maker And Repairer with him was his son Charles Stephen Cole age 9 born at Kensington London - Where was Mary? It did not take much to be placed in an Asylum in these times. Many people suffering from illnesses were classed as lunatics unjustly locked away. Today they would be simply treated with drugs. Once inside these institutions very few came out alive. Benjamin moved away from Mattishall - His wife Blythe died in 1844 and Benjamin died in 1860 both are buried in Sparham parish churchyard.